Yesterday, I mentioned this peanutty wonder, which I sampled at a recent tasting when it was paired with chocolate stout. It's a triple creme from Cowgirl Creamery, run by Sue Conley and Peggy Smith -- two farmstead-cheese pioneers with a soft spot for stink. Many of my friends are triple-crème lovers. Me? I don’t freak for brie, but I do like this wicked stepchild. It's a little bit truck stop and a little bit beachy. Each wheel is only about the size of a dinner roll. And yet, it’s full of flavor -- salty, luscious, peanutty goodness. Although the Troeg's chocolate stout I tried alongside this cheese isn't available any more (it was just a limited edition), I bet you could sub in Rogue Chocolate Stout and recreate the combo -- serve it after dinner in place of dessert, and tell your friends it's a fermented peanut buster parfait. My Red Hawk is on the counter right now, glowing like a holy relic under glass. And when the sun lights up the rind, I know I will never take a triple-crème for granted again. On Wednesdays, I’ve been skipping down to the Italian Market to enjoy the best kept secret: DiBruno Bros. hosts a free cheese-and-beer tasting. This draws the local cheese geeks and beer nuts out of the woodwork from 5-8, and if you play fly-on-the-wall, you can pick up some good tips…on local restaurants, on books, on which cheeses are perfectly ripe. This week DiBrunos hosts Lancaster Brewing Company, right out of Amish country. Their Milk Stout and Amish Four Grain look particularly interesting, but mostly I’m curious to see what the cheesemongers pull out of the cave. Two weeks ago, I sampled a wedge of peanutty Red Hawk and a gulp of Troegs chocolate stout, and I went weak – weak, I tell you – in the knees. The combination tasted like a boozy Snickers bar. Last Wednesday, I melted for some perfect Taleggio, paired with Iron Hill Pilsner. If the tasting whets your whistle, head down to the Royal Tavern for a smoked-gouda burger, and if you find youself eying the truffled popcorn – go for it. It’s perfectly salted, lightly buttered, and wickedly truffley. Confession: for two days, I ate it for breakfast. For more cheese’n beer goodness: put a big fat circle around Friday, April 30, when the Fair Food Farm Stand in Reading Terminal Market launches its Cheesemaker Happy Hour (4-6). Shellbark Farms’ Pete Demchur will join Sly Fox for some brotherly love. Word came this weekend that Amy Strauss received her cheese gift box, part of my stink-a-versary give-away. Amy requested some Prima Donna, one of my faves. I hope she is enjoying every toffee-like bite on this rainy day here in Philadelphia. Me? I'm at work, airing out my office. Yep, my wine fridge (which serves as a cheese cave) has become a little whiffy over the course of the semester. In fact, this morning the custodian came by to ask me if I had noticed my "mold problem." I was a little embarrassed to tell her that it was from storing cheese in my office. Looks like I'll be investing in some air freshener. Yesterday I woke up to my cheese-packed fridge and decided it was time to plan a picnic. The sun was out, the cherry trees along my block were in bloom, and the park near my house was hosting a music festival, the much-loved Shadfest – named for the fish that used to lurk in the waters of the Delaware River. Now the Delaware is mostly populated by floating beer cans, but the neighborhood has revived its connection to the water, and Shadfest has become our mini Woodstock, drawing live bands, dog lovers, Frisbee players, and bike nuts (who appreciate the valet bike-parking service). Oui, c’est vrai. I had a lot of triple crème cheeses in the house, so I called up Aimee, a.k.a. the Triple-Crème Freak. Along the way, we ran into Joe and Roddy, my local connection to cheese markets of the Northeast passage, i.e. Datillo's. And then my buddy Mike and his fire-haired boy appeared, and so our little picnic became an impromptu cheese party. We nibbled on Minuet, Largo, Rondo, and Acapella – to the backdrop of Birdie Busch and the Strapping Field Hands. Music to the ears and mouth. Permit me to continue my goat cheese tutorial. I have eaten the ash puck of all ash pucks, a yeasty goat cheese from Petaluma, California made by a classical pianist. In fact, every cheese made by Soyoung Scanlan is named after music, but Acapella – it’s something else. It is the most lyrical cheese I’ve ever eaten. Thanks to the folks at DiBruno Bros. for inviting me in yesterday for a nibble of this new arrival. Scanlan makes cheese for Thomas Keller, of Napa Valley’s French Laundry and New York’s Per Se. You won’t find her cheeses, sold under the Andante Dairy label, at very many cheese counters, but they appear on best-of lists compiled by dairy-lovin’ celebs like Janet Fletcher. Some of Scanlan's other cheeses include Metronome, Minuet (a gorgeous triple crème), and Rondo (a mixed milk bliss-inducer dotted with pink peppercorn and tarragon). Of the four Andante cheeses I tried, Acapella was the stand-out, not just because it was rolled in ash and Penicillium Roqueforti – I know, I know, my weakness – but because it was so distinct, so quirky. Imagine eating a cheese that tastes like the smell of fresh bread dough rising in your oven under a wet towel. Andante’s even got the same springy consistency – when you push down on it with a finger, it pops right back up. DiBruno’s Hunter Fike calls the cheese from Andante Dairy “amazing.” He favors Scanlan’s Minuet, a goat’s milk triple crème that is so tender and mild you could cry. I like a cheese that haunts me, and Acapella does that. It hits notes I’ve never tasted in a goat cheese; even the smell of it – I have a tiny wedge in my crisper – makes me shiver, makes me want to put on some Tallis Scholars and lay down on the floor in the dark and just hum. Over the weekend, I hosted an all-goat blow-out. Really, I just wanted to show off the glorious work of Amazing Acres’ Debbie Mikulak, a new artisanal cheese maker from Elverson, Pa. whose pristine chevre has every cheesemonger I know talking. Debbie makes unusual goat cheeses – her Sea Smoke reminds me of Humboldt Fog, the famous ashy streaker from California’s Cypress Grove, but Debbie’s version has a bloomy rind, which lends an Alice-in-Wonderland-like quality to this delicate, pleasing cheese. Picture Humboldt Fog as a mochi ball, and you’ve got the texture down – a veil of damp, slightly gummy bloom serves as the surface here. Sea Smoke looks like a magic mushroom, a cave formation, a doorknob into an underworld of talking caterpillars and rabbits. The texture is dense, moist, and a little chalky – crumbs settle on the tongue, like cloudcover. The taste is slightly floral at first, with a mild tang, and a flourish of pepperiness at the end -- think watercress. The layer of vegetable ash is mostly tasteless, but there's a woodsy cleanness to the whole package – it’s a spring dream. I like it best with blackberries and strawberries, as dessert. For a light supper, it would go well with sautéed fiddleheads and a glass of Prosecco. Debbie also makes Banon, a denser cheese she wraps in grape leaves and soaks in brandy – a nod to the French, who popularized this adorable, giftable cheese in Provence (the French use chestnut leaves and eau de vie). Debbie’s version is firmer than the French varieties I’ve tried, but really delicious, a perfect appetizer alongside almonds and a glass of Cote-du-Rhone. I’ll be writing about Debbie’s cheeses for the next issue of Grid Magazine. I also mentioned her goat cheese in a recent segment of “A Chef’s Table” on WHYY, Philadelphia’s NPR affiliate -- it's at the very end of the program, listen-to-able at the link. I guess I’m turning into something of a Sea Smoke evangelist, but then…you know, I have a thing for bloomy rinds and ash. Here are a few scenes from Debbie’s goat-cheese debut, beginning with a photo of her and husband, Fred Bloom. New Jersey and cheese? I never thought I’d put the two together, but then my friend Albert (of Messy & Picky fame) texted me about Maidenhead. I saw the pics on his blog – here was a cheese that looked like a rusty wicker basket – and I got very excited. When I heard it was washed in Flying Fish beer, I lost my shizzy. Maidenhead has a cool story – it’s made on a sustainable farm, called Cherry Grove, in Lawrenceville, NJ where the cheese facility is run solely on a wood fire supplied by brush from local tree surgeons. This is a true farmstead cheese, which means that the maker uses milk from his own animals, not from other sources. It’s both organic and raw. Rah rah rah to that -- I love the depth of flavor that you get in unpasteurized cheese. Let it be known that I took this cheese to my Food Writing class this week, as a bonus tasting – they have been very brave (last week they sampled Purple Haze, Parm, and a raw whiskey-blue) – and at least one of them could not handle the stink. Maidenhead smells like a cow stall, true, but it’s just delicious. Imagine eating a chicken leg on a tire swing, and you’ve got the flavor notes. There’s a strong rubbery, gamey taste, initially – which sounds awful, I realize – but then it mellows, filling your mouth with sublime avocado. Wild. It’s a long-lasting, quasi-exotic ride – a little bit farmy, a little bit Costa Rica. Cherry Grove makes about 7 cheeses, including an arrestingly salty blue, called Shippetauken, and a buttery Piedmont-style washed-rind cheese that melts like a dream, Toma Primavera. I have a little crush on Cherry Grove Farm, not just because it has a purdy website but because it's so welcoming to strangers – there are tours and a farm stand. One blue-sky day, I will wend my way over the PA line to buy a wedge of Buttercup Brie and some free-range pork. Mmmm, I smell a farmstead breakfast sandwich. Thanks for all the kind comments, kittens. You know how to make a grrrl feel luvvved. Amy Strauss of the blog Apples and Cheese, Please won herself a stink-a-versary hunk of cheese by participating in my little game of cheese roulette, and I'll be sending her a wedge of Prima Donna (pictured above) shortly. I wrote about Prima Donna last July, when my friend Joe brought over this little picnic of goodness. It was the first time I'd ever tried this toffee-like, gouda-esque dream child. Now it's my steady party cheese because people always go ga-ga over it. It's dense and full of those little crystals that pop on your tongue -- they're lactic acid crystals, the sign of a well-aged cheese -- and they release a salty sweetness that is so pleasing. Cheers to Amy! I'm delighted that someone with a whisk tattooed on her foot won my first contest -- seems like a lucky sign. Friends, one year ago today I wrote my first Madame Fromage post. I was a dubious blogger, a print-world snob, and I was pretty sure this online venture would fizzle out. I only launched it to see if Frank Wilson, the Philadelphia Inquirer Books-Editor-turned-blogger, was right: he told a group of students that blogging was essential for any journalist-to-be, that blogging was important. Oh pooh, I thought. A year later, I’m writing about cheese twice a week and loving it. I spent eight years as a newspaper columnist – a job I adored but burned out on – and I never thought I’d trade in my press pass to write an online column from my kitchen table. Alas, I was wrong. Writing this blog has been a revelation. It’s become my cutting-board confessional, a place where public and private meet. I’ve been amazed to discover how many people like to read, comment, twitter, and email about cheese. There are a lot of dairy-curious folk out there who have asked great questions, and a lot of really well-informed cheese pros who have reached out, sharing knowledge and suggestions. In the last year, I’ve eaten at least 100 different kinds of cheeses, most of them artisanal, many of them made from raw milk. I’ve enjoyed great conversations with goat farmers and spent many nights awake in bed, reading books by Laura Werlin and Max McCalman. So, what’s next? Well, it’s time to blow some kisses. First smooch goes out to Marisa of Food in Jars, my hero, my mentor. Second smooch goes out to Nicole and Joan of Quince, who invited me to host monthly tastings at their store on Girard Avenue; these have been such a great way to bring people together around cheese. A spray of smooches goes out to the many fabulous cheese mongers in this city – thanks for the suggestions, the samples, the nudges, the notes. Albert Yee of Fair Food Farm Stand and Ezekial Ferguson of DiBruno Bros. have been especially kind. As long as I’m waxing nostalgic, I’ve got a smooch for Chef Coleman of WHYY’s “A Chef’s Table” – it was a pleasure to nibble PA Noble together – being on yesterday’s show was a highlight. Special props to my colleague, Aimee Knight, who brought Madame Fromage to the silver screen with the tiny cheese flick, "Balsamic Boudoir." Finally – I hear the Oscar music twanging in the background – a spray of smooches to all of you. Thanks a thousand pixels. Below, I offer my favorite cheeses of the year -- in no particular order. Don't forget, there's still time to leave a comment on my Stink-a-versary post and win a free wedge. Winner announced tomorrow. Cheers! Loved ones, this Sunday will mark one year of blogging for yours truly. To celebrate, I’m going to make grilled cheese sandwiches for all my neighbors, and I’m going send one of you a hunka cheese. That’s right. Respond to this post and tell me about a fave cheese, and I’ll send you a wedge of any cheese that I’ve written about in the last year. You pick. On Sunday night at 7 p.m. (EST), I’ll randomly choose a number out of a wool beret, and the corresponding commentator will get a dream box in the mail. The only hitch is that you must live in the U.S. In the meantime, thanks for keeping a grrrl inspired. I love writing about cheese, and I look forward to eating a lot more stinkers in the near future. Note: this is not a gimmick or a promo for a cheese company. It’s just little ol’ me; I’ll buy the cheese, pack it in a box, kiss it good-bye. Maybe we’ll become pen pals. The Brit is right. Cabot Clothbound Cheddar appears mummified; it’s look and taste call to mind certain scenes from “The English Patient” – think of the heavily bandaged Ralph Feinnes, then recall the opening shots of the African desert. Swoon. This cheese is literally bandaged, then cellared, and carefully nursed to perfection by the laudable folk at Jasper Hill Farm, who are well known for their award-winning Bayley Hazen Blue. The result is a cheddar with starry crystals and narrative. The taste is bracingly sharp at first, the texture firm, but then it melts on your tongue, releasing a woodsiness that reminds me of sweetgrass – the scent of it. Along the way, lactic acid crystals release their salty, caramel notes. Extraordinary. This is a cheese that just tastes better and better the longer it sits out, and alongside a glass of sherry or a pint of cask ale, it’s stunning. Interestingly, this is a pasteurized cheese, and it’s only aged 12 months -- not years, the way some cheddars (Hook’s, for example) are put to rest like long-sleeping beauties. I went to Denver, Colorado for a writers' conference this weekend, but I got sidetracked by cheese. First, there was soul-food mac'n cheese at Tom's Home Cookin' in Five Points, then there were late-nite nachos at Garbo's, followed by cream-cheese-stuffed French toast yesterday at a Jewish deli. Just as my friend D. was driving me to the airport this morning, he remembered an all-grilled-cheese joint in Denver, called Chedd's, and we almost had to turn the car around. Luckily, I was still full from our cheese party the night before, a meal crowned by gorgonzola-slathered steak and preceded by one of my fave new discoveries: marinated chevre. I went to Denver on a mission -- to eat some mountain goat cheese from Colorado's beloved Haystack Mountain Dairy, based in Longmont. Having eaten my share of Pennsylvania goat cheese lately, I was curious to nibble at new elevations, and Haystack's gorgeous jar of chevre floating in herbs and oil was a highlight -- better than the mac'n cheese and the stuffed French toast put together. Sometimes the simplest pleasures are unadulterated, and that was the case as I reached into this jar and withdrew a moonish cutlet gilded with crushed herbs. My old roommate, David, was working on his Parm risotto, and his partner, Tim, stood at the fry daddy, staring into bracelets of breaded onions, while I sat purring in a corner chair, goat cheese in my mouth, olive oil running down my wrists. Haystack's marinated chevre was delicate and pillowy, fluffier than other marinated goat cheeses I've tried. The mouthfeel was exquisite -- not the slightest bit chalky or grainy -- and the flavor, it tasted of mint and fresh snowfall, bringing to mind a spring herb garden, lightly dusted with sleet, the herbs still young and tender. What are the Haystackers feeding their goats? The rest of our cheese party surpassed my expectations. David's risotto was gorgeously mushroomy, Tim's onion rings were feather-light, and the gorgonzola-garlic butter I made to top our steaks was furious good (see recipe below). Next time I'm in Denver, I want to try Haysack Peak, an ash-coated pyramid that won first place at the 2009 American Cheese Society Awards. And I want to check out Chedd's for a Meatless Horse Sandwich. In the meantime, I'll keep dreaming of that pillow-light chevre, atop a crusty baguette with green olives. Glorious. An hour before eating, roast the garlic bulb at 400 for 40 minutes -- you'll want to lop the top off, drizzle it with a little olive oil, and wrap it in foil. When it's fini, mash it in a bowl, until it's pulpy, then stir in butter, gorg, chives, and salt and pepper to taste. Slather it on grilled steak, and save whatever is left to spread on toasted baguette. I’ve been on a goat cheese bender lately – the light, lemony taste of fresh chevre just reminds me of spring. Aged goat cheese, on the other hand, is my new tote. I picked up this tiny puck of Crottin over the weekend, and it was so cute -- like a child-size brie – I wanted to put it on my desk at work and use it as an eraser. Pete is a self-taught cheesemaker who runs the oldest goat dairy in Chester County. He started about 15 years ago with a few goats, and now the man makes cheese seven days a week. This summer, he and his wife Donna are debuting a couple new cheeses, including Crottin and jars of marinated goat cheese biscuits (soft, unaged goat cheese in oil and herbs). I have one in my fridge and it is so damn beautiful, I hate the thought of opening it. If you’re open to compact, barnyardy goodness, Shellbark Hollow’s Crottin is worth seeking out at a Philadelphia Farmers’ Market. The Demchurs sell at the Piazza on Saturdays, and at markets in Chestnut Hill and Elkins Park. 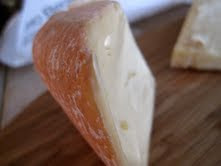 Crottin would be great on a spring cheese board, or served warm on a salad of grilled asparagus and woodsy mushrooms. The flavor is a conversation piece; it escalates from salty-sour (that catches you in the back of your cheek pockets) to a barnyardy headiness that seems to off-gas through your nose, then it turns green-apple-and-black-pepper on you at the end. Crottin means “turd” in French, but this is no cheese worth tossing. It does kick you in the arse though, so watch out. Note: Check out the "Meet the Cheesemaker Happy Hour" that the Fair Food Farm Stand is launching on April 30, from 4-6 p.m. in Reading Terminal Market. Shellbark's Pete Demchur kicks off the first one. Ask him about his Crottin and tip back some beer provided by the good folks at The Foodery. Hooligan, oh Hooligan, you make me feel born again. I love your rural notes – exhaust of pick-up trick, eau de boarded up barn. You have a boot-like rind that looks like salty leather, that smells like spruce bark. When I crack open a nutty brown ale with you on the porch, I am transported to a backwater bar with peanut shells on the floor, Johnny Cash on the jukebox, and plenty of dusty taxidermy. You are wild. You are utterly, utterly a dream cheese for the girl with ratted hair and Daisy Dukes. Note: some cheeses make you pen notes on napkins, others make you twitter your friends. Truly awesome cheeses make you write love poems. This cheese, by Connecticut’s Cato Corner Farm, yeah, it made me want to go Byron on it. Maybe that’s because farmstead cheesemaker Mark Gillman used to be a 7th grade English teacher before he dropped his grade book and picked up a bucket of raw milk. I think I can still taste some Norton Anthology, and maybe some Leo Kottke. If you are a friend to the stink-meisters, this award winner (Slow Food, Saveur) is worth begging your cheesemonger to order; it’s also available online, if you want to contact the maker. I can’t remember the last time I ate a cheese with so much personality. Maybe it’s because Gillman rubs his cheeses with unusual ingredients – buttermilk and salt, in this case. Gillman also makes Drunken Hooligan, which is washed with grape must, and Despearado, which is bathed in Pear William eau de vie and fermented pear mash. Try Hooligan with a nutty ale, a Trappist charmer. Then put on your cut-offs and eat it in the wild. Don’t be surprised if feral cats begin winding themselves around your legs. This morning, I flew out of bed with one desire: Market Day Canelés. These heavenly sweets, made by Gil Ortale, just started appearing around Philadelphia, and this morning Ortale was at the Piazza Farmers’ Market in Northern Liberties. No, these gems don’t have anything to do with cheese, but they are honorary cheese to me. Their crispy exterior and custardy interior (infused with hints of orange and rum) are complex enough to make them the brie of pastries. Two fabulous cheese makers also had stands. Shellbark Hollow Farms is showing off two new delicacies, jars of marinated chevre – these are perfect for picnics – and Crottin de Chevre, a brie-like wonder that has been aging since February. I met Noelle Bakri, a new Shellbark staff member who approached the Demchur family about learning to become a cheesemaker. Go, Noelle. Birch Run Hills Farm, makers of the most beautiful local blue, had some new cheeses to sample, including Equinox, a quirky aged cheese that made me think or muesli with yogurt – nutty, lemony, dense. I’ll be picking up a wedge real soon. Alas, I blew all my money on Market Day Canelés. For those of you in ma neighborhood, these Canelés are sold throughout the week at Quince Fine Foods at 2nd and Girard Ave.
Other treats at the Piazza Market: yarn, grass-fed beef, John & Kira's Chocolates, Amaranth Bakery breads (gluten-free), beautiful herbs & veggies, soaps, organic eggs, locally roasted fair trade coffee, and lovely lovely people. Check it out on Saturdays, 10-3.